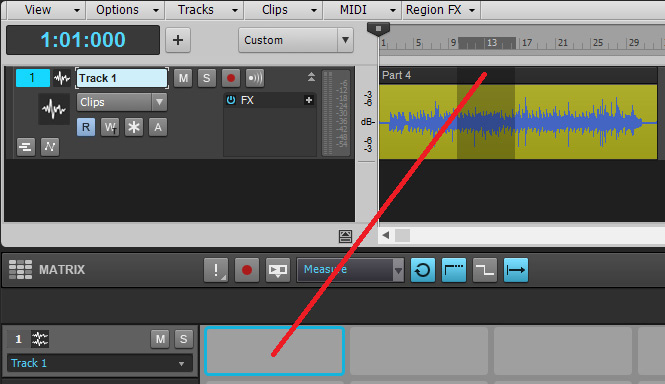 It’s possible to insert instrument tracks in the Matrix View, not just audio and MIDI tracks. Find out how Sonar’s enhanced Matrix View can help speed up your workflow. When Sonar introduced the Matrix View, some assumed it was just for EDM fans — but what makes the Matrix View so universally useful is its integration with the rest of the program. Two recent updates have taken this integration further (and props to Cakewalk developer John Joseph, who’s taken the lead on enhancing the Matrix View). You can now open a cell’s audio or MIDI clip in the Loop Construction View or Step Sequencer, respectively, by doubling-clicking on the cell (or using the keyboard shortcut to call up a view, eg. select a cell with a MIDI clip and type Alt+4 to open the Step Sequencer). However, if the cell doesn’t contain Step Sequencer content but a regular MIDI clip, you need to convert the MIDI clip into a Step Sequencer clip, by right-clicking on the cell, and choosing Convert MIDI Clip(s) to Step Sequencer. You can do edits in the Step Sequencer while it’s playing, but if the clip was opened from the Matrix View, you won’t hear the results of any edits until you stop and restart the loop. This is true whether you’re stopping and starting in the Matrix view, or using the Step Sequencer’s play/stop button. This behaviour is different compared to opening a Step Sequencer clip sitting in a track, where stopping and restarting isn’t needed. And speaking of the Step Sequencer, you can also create a Step Sequencer-based cell by right-clicking in the cell and selecting Create New Step Sequencer Cell. The Step Sequencer opens up, and you can start creating your pattern. Note that the same rule about stopping and starting to hear any changes also applies because the sequence is cell-based, not track-based. Editing audio loops is a bit more complex because after editing the loop, you need to save it (in the Loop Construction View, choose Clip / Save Loop) and replace the clip in the cell with the saved, edited version. The Options menu has another cool Step Sequencer improvement: Unlink Step Sequencer Clips from Clips Pane, which lets you choose whether dragging a Step Sequencer clip into the Matrix View creates an unlinked or linked clip (where changing one changes the other). The main benefit is you can drag the same Step Sequencer clip to multiple Matrix View cells from the Clips Pane, but make changes in the Matrix View clips. This is one of my favourite new features, because you can insert an instrument and associated MIDI row with one operation. Right-click in a row (where the headers are, not the clips) and choose Insert Instrument Row. Then, choose the instrument to insert. This is even more convenient now that you can create a Step Sequencer clip from within the Matrix (note that this clip will simply be named ‘MIDI’ so you’ll probably want to right-click on it and choose the Rename function). This is part of an overall effort to improve Row Management via the right-click context menu, and the above applies to audio and MIDI rows as well. You can also do track assignment to some extent when inserting for audio, MIDI, or instrument tracks. If you click below the existing rows, the inserted row will be appended to the end and assign the row to a new track. If you right-click on an existing row of the same content type, the inserted row will appear above the row where you clicked and be assigned to the same track on which you clicked. If you right-click on an existing row of a different content type, the inserted row still appears above the row where you clicked but will create a new track. The context menu also lets you copy, clear or duplicate a row. Suppose you have a long audio or MIDI recording in a track, and it has lots of potential for extracting loops. Drag across the section of the clip you want to turn into a loop, then click on the clip’s handle and drag the extracted section into the Matrix View. Unlike moving part of a clip elsewhere in the Clips Pane, this does not separate the section from the longer clip (a function which of course also has its uses). This is a great way to test loops, because I often create loops by playing for an extended period of time and then cherry-picking the best sections. The new functionality simplifies the process considerably, especially with being able to open them easily in the Step Sequencer or Loop Construction view. That means you can tweak them, and if they’re really cool, save them or drag them into the Clips Pane as new loops. Selecting part of a clip, then dragging its handle, brings only the selected part of the clip into a Matrix View cell. This also ties in well with the loop-extraction process mentioned earlier, because you can keep dragging in clips to new rows while still having them all assigned to the same output for easy auditioning. Furthermore, managing clips takes less time because you’re no longer limited to moving, clearing or copying cells one at a time. You can use the standard Windows options (click then shift-click to choose contiguous cells, or Ctrl-click on non-contiguous ones) to mass-manage clips. This applies not only to operations within the Matrix View; you can drag in multiple clips from the Browser (and if you hold Alt, they will be assigned to the same track output). The drop zone for multiple clips will have blue outlines around the cells where the clips will end up. However, note that using the Alt modifier has no effect when dragging clips out of the Matrix View. If you drag, for example, six MIDI clips from the Matrix View to the Clips Pane, they’ll create six new tracks. As to other improvements, holding the Alt key while dragging one cell to another cell of the same type swaps the destination cell with the source cell. There’s also a change to column triggering, because it triggers all cells instead of toggling each cell’s state. Also, you can now clear a column by right-clicking in the column header (choose Clear Column). Finally, there’s an Options menu function for ‘Follow Transport Restores Pending Cells on Stop’. If ticked, any cells that were queued up to start when you hit play will also be queued up when the transport stops. There are several tricks you can do with the Matrix View that don’t really relate to its intended functionality, but are useful nonetheless. For example, when cutting and pasting clips to move around within a project, sometimes you might want to ‘park’ them somewhere prior to moving them to their final destination. You can always drag and drop to a scratch track or the Browser, but using the Browser requires either setting up a folder for the clips, or including them in with the other project audio files. It’s simpler to drag the individual clips into Matrix View cells, where they can hang out until needed. As one example, you might want to split a solo into multiple clips so you can rearrange the order of phrases. Just remember to turn off importing as Groove Clips in the options menu. The Matrix View makes it easy to place clips end-to-end in a track.Sonar doesn’t provide a way to select multiple clips in the Browser, then bring them into the Clips Pane so that the clips follow one right after another in the same track — they’ll always end up in different tracks. You can drag them in one at a time, but then you have to make sure that in Preferences, clips are selected as a snap-to option. A simple workaround is first to untick ‘Import Content as Groove Clips’ in the Matrix View options menu, then drag the clips, in the desired order, into the same Matrix View row. Next, select them all and drag them to the Clips Pane. They’ll all line up end-to-end, with no spaces in between regardless of the snap settings. Of course, if you want them to be Groove Clips, you can do that as well — just import them as Groove Clips. As you can see, the Matrix View isn’t for EDM only — it’s a powerful tool for songwriting regardless of genre, and it’s also a great scratch pad. But we’re out of space, so maybe that would make a good topic for a future Sonar workshop!